Rachel Von | The Journal Gazette The Mad Ants' Walt Lemon Jr. , right, goes in for a layup as the Wisconsin Herd's Xavier Munford tries to block his shot during the third quarter Monday at Memorial Coliseum. The Mad Ants' mentality right now is simple: Just win out. -- A win in either game would give Fort Wayne the Central Division championship and the No. 2 seed in the Eastern Conference behind the Westchester Knicks (32-17) or Raptors 905 (30-18). -- If the Mad Ants lose both games but Grand Rapids (27-21) loses once, then the Mad Ants would get the division title on the second tiebreaker (divisional record) and the third seed because they would lose the first tiebreaker (head-to-head record) to the Southeast Division champion, either Erie or the Lakeland Magic (26-22). -- If they lose both games and Grand Rapids wins out against Greensboro and Long Island, then the Mad Ants would have the fifth or sixth seed. 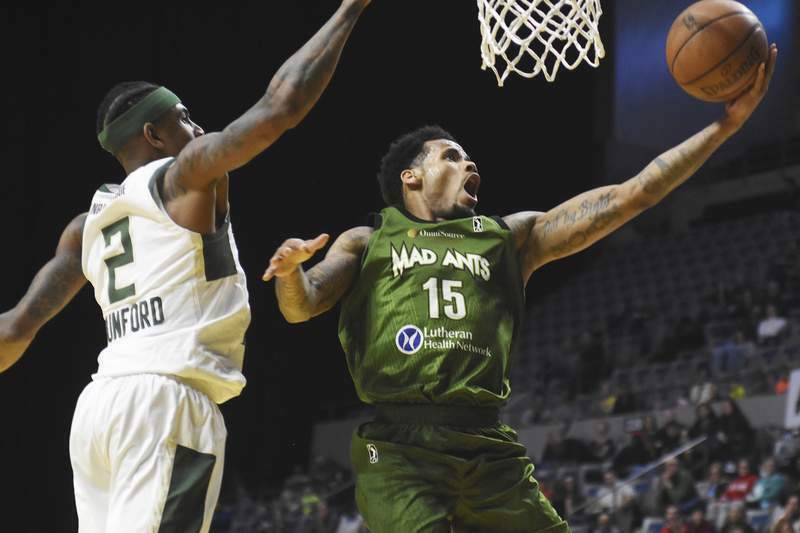 The incentive for the Mad Ants is clear, aside from accolades: Getting a division title guarantees they play their first game in the playoffs at the Coliseum. Considering the postseason is single-elimination until the best-of-3 finals, and the Mad Ants are a G League-best 18-6 at home, that would be huge especially if they get a bye through the first round. The first and second seeds in the conference will get those byes.